The various arguments for the existence of God were not often employed by Christadelphians back when I was a member. I'm not sure if it's because they were not aware of them, or because the arguments were made by non-Christadelphians, or some other reason. Nevertheless, the arguments do surface occasionally, and in this article I thought it would be interesting to look at the Ontological Argument for the existence of God. By definition, God is a being than which none greater can be imagined (that is, the greatest possible being that can be imagined). This seems to be compelling to many people, but I don't think it's valid to think you can reason something into existence. It seems rather more likely that this is just sophistry. The same argument could be used to support any notion of a being with some maximum objective quality. For example the argument works just as well for a maximally evil being. But we can also come up with examples that should cast doubt on the argument itself, and I find that particularly helpful in reasoning about it. Consider Pod, which I will define as a being of greatest mass. By definition, Pod is a being than which none more massive can be imagined (that is, the most massive being that can be imagined). Pod exists as an idea in the mind. A being that exists in reality can be more massive than a being that exists in the mind. Thus, if Pod exists only in the mind, then we can imagine a being that is more massive than Pod (that is, a more massive being that does exist). But we cannot imagine something that is more massive than Pod (for it is a contradiction to suppose that we can imagine a being more massive than the most massive being that can be imagined). No, I am not arguing for the existence of Pod. Because if such a massive being actually existed, it would necessarily include all mass in the universe (and more), which is obviously not the case, so therefore there must be a flaw in the argument. I suggest that any flaws in the latter argument are likely to also be present in the former, but the latter form may make them easier to spot. One such flaw I can see is that imagined beings have no mass. Thus it is impossible to imagine a "more massive being". Likewise any "being we can imagine" still exists in the mind. That is, it does not exist in reality (I suggest it isn't even proper to speak of "imagined things" as "existing" but I won't pursue that line of reasoning here). Thus it is impossible to "imagine a being that exists in reality", and so it is impossible to imagine a greater being than one that only exists in the mind. You simply cannot imagine a being into existence, yet that is what this argument tries to do. There are many other forms of Ontological Argument, some which talk about existing necessarily, and others which talk about positive properties, but in essence they are all trying to derive the existence of some maximally great being from mere reason. I think this style of argument, or even the use of argument itself to prove the existence of something, is flawed. I will list some objections below. You may well find more (and better) objections if you search on the internet. 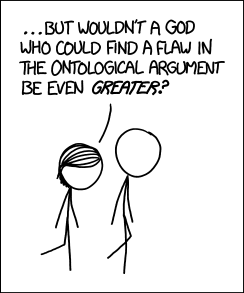 The Ontological Argument tends to only be used to argue for a particular being. But there's nothing intrinsic to the argument that requires it to be used for beings. It could also be used to argue for a maximally great pumpkin, or magic carpet. For some reason no one argues for the existence of those things. Magic carpet is surely greater than normal carpet, and greater still if it exists in reality. One issue with all arguments for the existence of god(s) is that even if true, they would only support deism. That is, the belief that some god or being exists, but we know nothing more about it. It doesn't support the Christian god any more than it supports Zeus. It could be that this god really does exist, but has no interest in us, doesn't care what we believe, has no plan to save us, and/or differs from modern religions in any number of ways. The Ontological Argument can be used to argue for the existence of beings that are almost the complete opposite of one another, and there seems to be no limit to the attributes such a being could have. Perhaps it is also maximally tall, short, funny, miserable, beautiful, ugly, you name it. As soon as you decide that some quality existing in reality meets some criteria more closely than a similar quality existing only in the mind, then the Ontological Argument suggests you have just discovered another being, or another attribute of an existing being. Yet apologists seem to mainly focus on existence and "greatness" (whatever that is). What about other attributes? Some versions of the argument, such as the one above, speak of existence in reality in contrast to some other form of existence (in this case, existence in the mind). It is not immediately clear to me that any such existence outside reality is possible, nor that it is proper to speak of something "existing in the mind". At the very least this would seem to me to conflate two different meanings of the word "exist", namely things that exist in fiction vs things that exist in reality. Note also that fictional existence (if that is how we are going to describe it) necessarily exists inside reality, which may complicate things a little. On the other hand, if existence in minds is distinct from existence in reality, then who is to say which existence is "greater"? Is there any such thing as "outside reality". Is it possible for something to exist outside reality? I don't know the answer to this, and I'd like to see it demonstrated (though I don't know how) rather than blindly accept it. It's interesting to note that modern definitions of God place him/it outside space and time. Again, it's not immediately clear that it even makes sense to say that something "exists" outside space and time. Every kind of existence we are aware of is specifically within our universe, and causally connected to it. I'm very wary of those who insist that whatever applies inside the universe must also apply to the universe itself. Why must that be the case? and how do they know that? Many versions of the argument hinge on the words "possible" and "necessary". That is, they assert that there is some "possible world" where God exists necessarily. Or they assert outright that it is "possible" for God to exist. But how were these conclusions reached? Generally they weren't. They are typically just assertions made with little or no justification. No one demonstrated that it was possible for a god to exist, because they can't. There is no way to do that. That's why they use argument instead. I think that is rather telling in itself. I'm not a philosopher, so I don't intend to dive too deeply into the guts of each version of the argument. I suspect that many of these arguments hinge on linguistics and definitions, and it is often very difficult to spot cases where two distinct meanings of the same word have been conflated, or where the premises are based entirely on human intuitions that may not hold true in all of reality. Why are such arguments necessary? I think it's interesting to ask this question. Why do believers follow this road in the first place? I suggest we can reason backwards to answer that question. Given a choice between clever arguments and actual, tangible evidence, it seems clear that evidence would be much preferred. Yet there is no evidence for the existence of any god(s), so believers resort to argumentation instead, since that is all they have. But if argumentation is all they have, why did anyone believe in such beings in the first place? People believed in god(s) long before these arguments were thought up, so why were the arguments necessary? In any case, is such argumentation reliable? We have countless examples from science where the evidence from nature overturned many ancient Greek and Roman ideas about reality that were based merely on philosophical argument. This should at least instil some humility in us when we think we can sit in an armchair and use our intuitions and reasoning to determine how the world really is. There are some notable exceptions, for example Einstein's theory of relativity, but the vast majority of ideas people have put forward about the way the universe works have turned out to be false. I do want to stress the point that I'm not a philosopher, so I can only offer my opinion on this. I'd welcome comments about my opinions that I have stated here, but any defences of the argument itself, or variations of the argument that I have not mentioned here, are probably better referred to the relevant literature. For what it's worth, very few philosophers are actually persuaded by ontological arguments, so that's something to bear in mind as well. If you are interested in a more scholarly approach, start here or here.